This weeks Weekly Bake Off is Mary Berry’s Devonshire Apple Cake from 100 Cakes and Bakes. 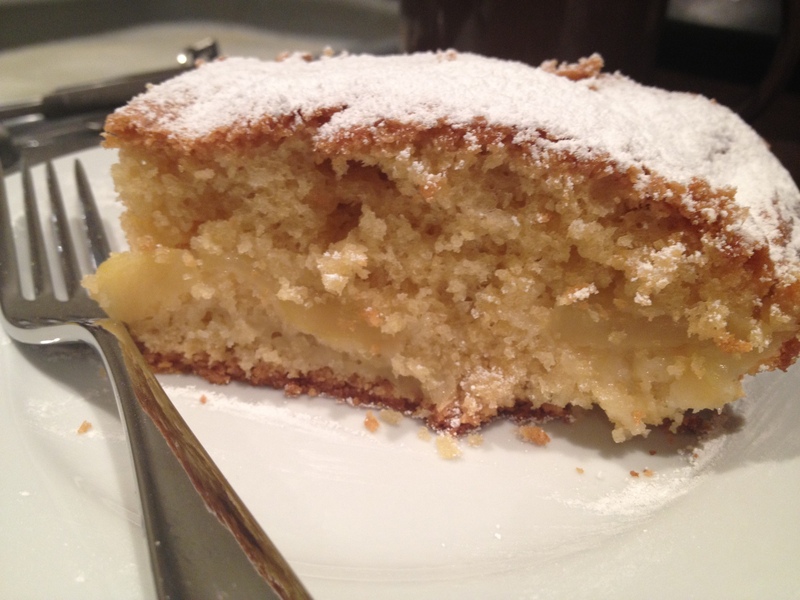 I am a massive fan of cake (you may already know this) – and of apples. We’ve had some cooking apples sitting about for a little bit, and baking fingers were itching to get stuck into a bake, so I thought I’d bake this and enter it into this weeks Bake Off! I soon realised I didn’t have all the ingredients for the Mary Berry original, nevermind. The recipe requires a teaspoon of almond essence… I added vanilla, and some amaretto, I figured it would do. And you’re also meant to pop some flaked almonds on the top, which I imagine gives the cake a really interesting texture, but I didn’t have any and alas it’s Sunday night so I just got on with it, so this is Mrs Bell’s Devonshire Apple Cake. I found the cake batter quite thick, but very easy to make, I do think if I made it again, I would try it with vegetable oil rather than melted butter – I did use margarine, but I still think that the oil is a bit of healthier option – it does have apple in after all! After making your cake batter, you need to place half of the mixture into the cake tin, and then arrange the apple slices before adding the rest of the cake batter on to the top. It’s at this point where if you had some flaked almonds you would sprinkle these on top. But this is what you get for on the spot baking! The final cake is then baked for about 1hr 15 mins, but luckily I checked mine earlier, and it was well cooked after 1hr 5mins, enough for me to take it out of the oven and distract the husband long enough for it to cool slightly before tucking in. We had ours with some evaporated milk – the height of elegance I hear you cry, but it was rather delicious none the less. I think the next time I make it, not only will I try and have all of the ingredients (the shame) I would add more apple, because that was my favourite bit. This cake would be amazing with some softly whipped cream mixed with calvados on the side, very indulgent.